Kings Chance Casino is an online gaming site which provides numerous games to its players, especially in South Africa. It is owned and established by the Audeo N.V. E-Commerce Park Vredenberg Willemstad Casino since June 2010. The site is duly registered and licensed under the government of Curacao. It supports the mobile, instant play, and downloadable features of the gaming site. It also manages the available languages - which are English, French, and Italian - the site offers. Although it supports different currencies - such as US Dollars, Euros, British Pound (GBP), and South African Rand (ZAR) - it is only accessible to selected countries. Some countries in which the site is prohibited include Afghanistan, Azerbaijan, Bangladesh, Bulgaria, Cayman Islands, Curacao, Estonia, Hong Kong, Iran, Israel, Kuwait, Lebanon, Pakistan, Qatar, Saudi Arabia, Sint Maarten (Dutch), Tajikistan, Uzbekistan, Turkmenistan, Syrian Arab Republic, Singapore, Saint Eustatius and Saba Bonaire, Philippines, Macau, Kyrgyzstan, Kazakhstan, Iraq, Indonesia, Cyprus, China, Canada, Bhutan, Bahrain, Aruba, Netherlands, and other neighboring countries. It only gained its popularity among its South African players who experience convenience through the site's hassle-free currency exchanges and rates feature. Kings Chance's games are currently managed and developed by Rival Gaming, a renowned software developer in the gaming industry. Rival has been providing the site with numerous game titles which vary from table and card games, classic slots, virtual video slot machines, interactive i-Slots, video pokers, specialty games, arcade games, and high jackpot games. All these games offer its players with huge amounts of jackpots at stake, as well as game bonuses and special prizes. The collection of i-Slots games in this site is the most favored by most of its players. These games are presented with impressive graphics, interactive gaming platforms, and huge amounts of jackpots and free features. Some of the known game titles under this category include As The Reels series, Cosmic Quest 1 and 2, Heavy Weight Gold, Japan-O-Rama, Bowled Over, Cash Cruise, Fixer Upper, Hole in Won, Psychedelic Sixties, Reel Crime 1 and 2, Midway Madness, Rock On, Spy Game, The Back Nine, Wild Safari, Switch In Time, and Sherwood Forest. 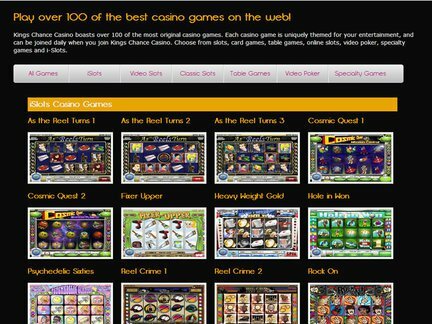 The site also offers classic and virtual video slot machines which include famous titles like Big Cash Win, Bust A Vault, Snow Wonder, Chicken Little, Fantastic Fruit, Loco 7's, Win Mill, 5 Reel Circus, Astral Luck, Best of Luck, Coins of Olympus, Diggin' Deep, Flying Colors, Goldenman, Ice Picks, and many more. KingsChance also provides its players with conventional table and card games which include variants of roulette, blackjack, baccarat, poker, and dice games. Some game titles included in this category are Multi-Hand Blackjack, Let It Ride, European and American Roulette, Craps, Red Dog, Pai Gow, and a lot more. Video poker games are also offered in the site which includes titles like Jacks or Better, Aces and Faces, Deuces Wild, Deuces and Joker, Joker Poker, and Double Joker. These games provide crisp animations, easy-to-use gameplay, and great payables. Other games offered in this site include specialty games such as varieties of Bingo, Keno, Gunslingers Gold, Sudoku, Tiki Treasure, and Penguin Payday. In terms of the bonuses and promotions, the gaming site provide a variety of incentives for its players. These include the usual sign-up reward for its new players. A R100 welcome credit is granted to its new players who don't need to make any deposits yet. Another welcome offer is their R10,000 package which can be distributed among the first three deposits of the players. The site also offers daily, weekly, and monthly promotions to its players. These include their Weekly Cashback Promo - wherein players get up to R5,000 worth of the player's total losses back every week, Midweek Top-up Bonus - which gives a 100% deposit credit upon the initial deposits every Wednesday, Monthly Reload Credit, Birthday Promo, Weekend Credit, Refer-a-friend Incentive, and other daily bonuses. All these promotions and incentives have attracted more South African players in general for its special features and offers. Overall, Kings Chance gives its players with quality games for their complete and exceptional gaming experience. The site also offers a 24/7 customer support which is available on different platforms. It also provides several banking options to its players for their convenience and security. The site also boasts its 96.31% payout percentage, as well as its players' high chances of earning huge amounts of cash payouts through their games. Another special feature of Kings Chance is its availability on several versions which include its downloadable, flash, mobile, and instant play features. All these versions are both available to both its online and mobile gamers. However, several public review sites have pointed out the site's unavailability to some countries as its downside. This site unavailability is generally caused by the restrictions raised by the said countries which prohibit any gaming platforms for their residents. This limits the possible number of players for the site, as well as other reviews they may receive from other players. Nevertheless, Kings Chance is awarded with a 4 out of 5 rating for its easy gameplay, impressive bonuses and promotions, top-of-the-line games, security, and accessibility to its players.